Executing strategic goals and objectives is the greatest challenge in business today. Aligning the organization’s managers and work teams with your most Wildly Important Goals and objectives is a never-ending battle. In addition, keeping managers and work teams engaged and focused on the top goals is critical. Imagine an organization where managers and work teams are focused and aligned to the most important organizational priorities. Overcoming these breakdowns is not easy. Far from it. While most workers have more choices and more technology than ever before, very few know how to filter through all the competing priorities to flawlessly execute on their most important goals. Unlike most traditional business management strategy training, the purpose of The 4 Disciplines of Execution: Manager Certification is not just for business management strategy, but to help managers create actual work plans. The outcome of this 6-month long process is to identify the most important goals for each manager and team to pursue, then to create measures and identify the key activities that will predict goal achievement. Participant Guidebook​ – ​​this manual is filled with examples and exercises that continue to enhance the learning process after the course is over. Business Management Strategy Essentials Boo​k – ​​this book provides a basis for the concepts taught in the course. Manager Certification Guid​e – ​​this booklet walks managers step by step through the certification process. 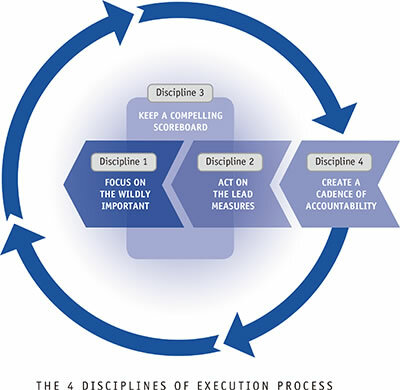 My4DX.com is a web-based software interface designed to run The 4 Disciplines of Execution. The software aims to simply for the WIG session, creates organisational visibility and accountability and sustains The 4 Disciplines. How can we can help you? Bring a FranklinCovey solution to your organisation so that you can achieve the transformational results that you want. Let us know what programmes you are interested in.